With the new school year in full swing, now is the perfect time to look at one of the most widespread health problems children are facing today. Childhood obesity now affects more than 16.9 percent of children and adolescents ages 2 to 9. Overall, nearly one-third of American children are overweight or obese. Several different things contribute to childhood obesity rates such as diet, exercise and other lifestyle choices. However, preventing obesity isn’t always as simple as eating right and exercising. Many children don’t live in communities that have affordable, healthy food available in the first place. Others may live in dangerous neighborhoods, places without parks or other outdoor areas, or in communities where physical activity is not the norm. Many of the steps to prevent childhood obesity need to take place community-wide, rather than on an individual level. However, there are still plenty of ways families can work to prevent childhood obesity together. The new school year is a great time to start new habits as a family. Even if everyone in the family is a healthy weight, these 5 habits can bring you closer together and make every family even healthier! 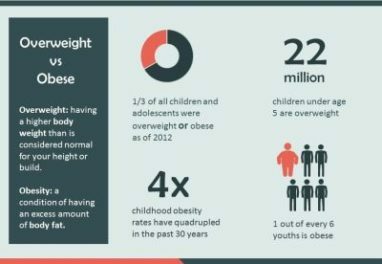 You can also learn more about childhood obesity in our new infographic. Cook meals together at home. With after school activities, it can sometimes be hard to find time to make meals from scratch and eat together. However, cooking at home saves money and it’s much easier to create balanced meals, portion food appropriately and limit the amount of processed food your family eats. On top of that, it brings the family together for quality time. If finding time is an issue, start with one meal together a week or gather some recipes that can be completed in less than 20 minutes. Limit screen time and find alternatives for video games. On average, children and teens have more than 40 hours of screen time a week outside of school. Rather than cutting time completely, it’s important to find a healthy balance. Most recommendations for parents suggest limiting kids’ screen time to less than 2 hours a day. According to a recent Iowa State University study, reducing screen time improves performance in school, improves sleep, and lowers the risk for obesity. Take a weekly walk together. If your family could use more time together, walking is a great way to start. Whether you walk around your neighborhood, drive to a city park or head to a natural area nearby it’s a fun way to get some exercise and hear about each other’s days. Walking around the neighborhood is also a great way to get to know to your neighbors and form a closer community. Find alternatives for sugary drinks. Drinks high in sugar are a major source of calories and can lead to an unhealthy weight. One reason for this is that sugary beverages often do not make you feel full, despite being high in calories. This can lead to overeating. Most people think of soft drinks when it comes to sugary beverages, but fruit juice is often just as high in sugar even though it is higher in nutrients. As an alternative, try unsweetened herbal tea, which is often fruit flavored. Walk or bike to school together during nice weather. Not everyone has this option, but it can be great for those who live near their school. Check out resources such as Safe Routes To School for more information on walking and biking to school in your community. If you find yourself driving less and less often as a family or if it’s simply time to get a new vehicle, consider donating your unwanted car to Wheels For Wishes. Our car donation program is a great way to get rid of nearly any vehicle and receive free towing and a tax deduction, all while helping children in your community. If you have a car to donate, we make it easy! Just call us at 1-877-431-9474 or fill out an online car donation form today.